Home Eco Friendly Guide	World's fastest moving muscle: Salamander can shoot its tongue 50 times faster than an average eye blink! World's fastest moving muscle: Salamander can shoot its tongue 50 times faster than an average eye blink! Can you guess, what is the most instantaneous known muscle in the animal kingdom? Its tongue! 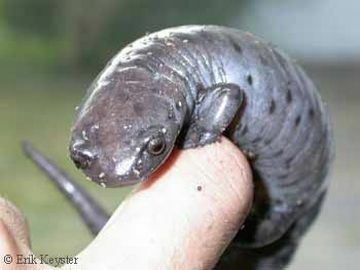 Yes, it is the powerful tongue of the giant palm salamander of Central America, which can be shot out more instaneously than any muscle ever known, according toa new study. The power with which the salamander can shoot its tongue out is 18,000 watts per kilogram of muscle. The salamander — Bolitoglossa dofleini – posing this power takes the place of the Colorado River toad — Bufo alvarius – which is now the second champ. It takes about 7 milliseconds for the Bolitoglossa to extend its tongue more than half its body length, which is about 50 times faster, compared to an average eye blink. 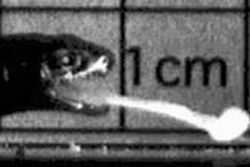 To monitor the animals as they launched at live crickets, Stephen Deban of the University of South Florida and his colleagues used implanted high-speed video cameras and electrodes in the salamanders’ tongue muscles, which revealed that the tongues were propelled outward much faster than what could muscle contraction alone achieve.